East Coast’s Sabbath-worshipping metallers HIGH REEPER are taking over Europe this April and May in support of the release of their new record « Higher Reeper », out March 22 on HPS Records. Headbang or die! Formed in 2016, HIGH REEPER is made up of Zach Thomas, Justin Di Pinto, Andrew Price, Pat Daly and Shane Trimble. Originally started as just a studio band, it rapidly became apparent that these songs were meant to be heard live and loud. The band made their debut in the Philly/DE stoner rock scene in early 2017 with success which was followed up by the recording of their self-titled debut in May. 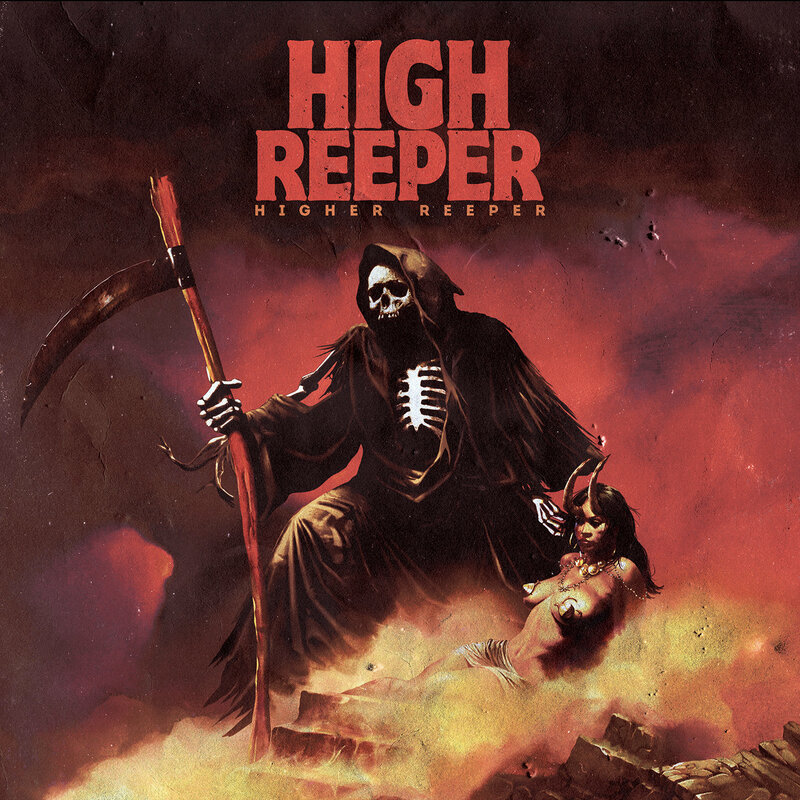 With a sound deeply rooted in modern stoner rock while still giving a nod to the earliest Sabbath records, HIGH REEPER‘s first offering is driven by pounding rhythms, thick guitars and soaring, screeching vocals. For their upcoming album ‘Higher Reeper’, the band evolved their sound into an even more powerful direction, filled with the fiercest riffs by an up-and-coming band sounding heavier than ever! 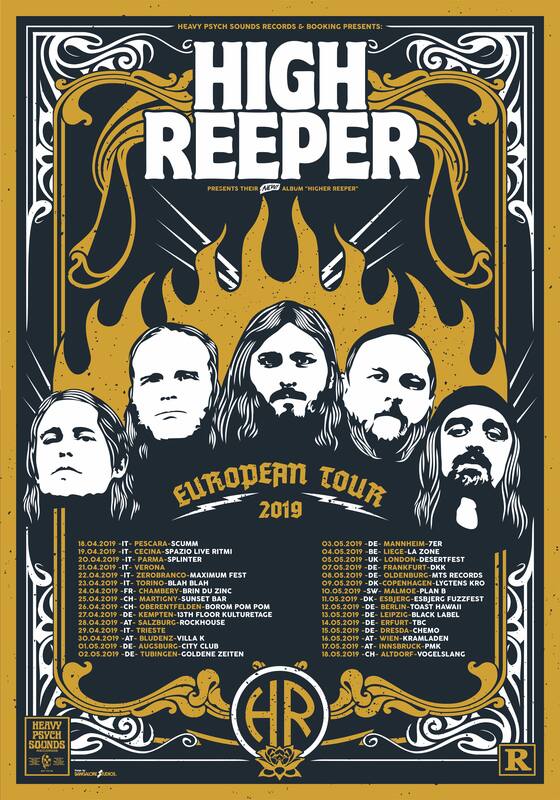 After a successful 2018 European tour that included Desertfest Berlin and in support of the band’s new album, HIGH REEPER will be heavily touring again next year with an extensive live schedule to be announced soon and which will also hold an appearance at the legendary Desertfest London 2019. With the addition of their new drummer Justin Di Pinto, the band has managed to focus their sound and expand it at the same time. The record is darker and heavier compared to their first offering, with guitars that will crush your mind and lyrics that paint a picture of the world nearing its end. While the sound of ‘Higher Reeper’ is more focused, at the same time it manages to be more complex and varied. With tracks ranging from ones as heavy as the album opener, “Eternal Leviathan”, to even an ethereal ballad “Apocalypse Hymn”, this LP will take you all the way to hell and leave you there to rot. Once again produced, engineered and mixed by bass player Shane Trimble at TTR studios and Delwood Sound and mastered by Mike Tarsia. Solomacello created the incredible cover that captures the mood of the record while giving a nod to classic heavy metal. Garage psych trio LITTLE JIMI to release debut album “EP.1” on November 16th via MRS Red Sound. DOPETHRONE release new split record with Fister; full European tour to kick off next month. Stoner rock legends NEBULA to reissue « Let It Burn », « To The Center » and « Dos EPs » via Heavy Psych Sounds in 2018!